Motor vehicle accidents are often caused by a driver’s poor decisions, behaviors or actions. At other times, car wrecks are caused by defective parts or other issues outside of drivers’ control. Sometimes, the very roads constructed to keep drivers safe can cause accidents. Disintegration of roads and bridges, broken pieces of cement or road materials, traffic cones, signage and issues of road construction can cause dangerous road conditions leading to accidents. State and local roads require funding for construction, maintenance and repair. Gaining funding for these projects takes a very long time, as does completion of the projects once funding is approved. Government funding keeps bridges in good shape, roads free of potholes and disintegration of roadways from occurring. Even slightly damaged roads can cause major accidents involving multiple vehicles, leading to injuries and even causing death. When funding for road safety is not available, the roads we use every day can become more dangerous than the drivers using them. Today’s road construction quality helps roads to last about 20 years before a major reconstruction effort must be undertaken. Regular maintenance is extremely important throughout these two decades of a road’s lifetime, with routine maintenance not being effective after the road’s lifetime has passed. This is because at the end of the 20 years, underlying issues are too great to be fixed by resurfacing or filling of cracks and potholes. Neglect of aging roads is a problem when funds are not available for reconstruction. Bridges have gained a lot of press exposure in recent years, as American bridges and infrastructure as a whole are aging. Aging bridges pose great danger, even when they appear to the naked eye to be sound. Bridges become less structurally sound over time and eventually start to fall apart. They must be repaired or even reconstructed to ensure the public and all vehicles crossing over or under them are safe. Driver behaviors and hazards from vehicles always pose danger to other cars on roads today. But when freeways or other highways are allowed to fall into disrepair, hazards are greater and can result in even more catastrophic accidents. Potholes, narrowing shoulders, crumbling sides of the road, uneven lanes and cracking surfaces can cause vehicles to lose control, leading to a serious accident causing injuries or death. Road construction is a terribly hazardous situation for both drivers and workers completing construction on the road. Many collisions occur in road construction areas, as drivers try to swerve away from workers in the road, maneuver changing circumstances of the road, handle their vehicle in more constrictive space or otherwise drive where construction is underway. All of the distractions of road construction being completed on an open road often cause drivers to make drastic mistakes, too. Paving materials used for repair or construction of a road can cause problems for drivers trying to see where they are going. Temporary signage may be placed improperly or incorrect in information provided to drivers. Lane closures slow and confuse drivers and often cause accidents. Speed limit decreases for construction safety are often disregarded or cause aggressive drivers to become more dangerous. 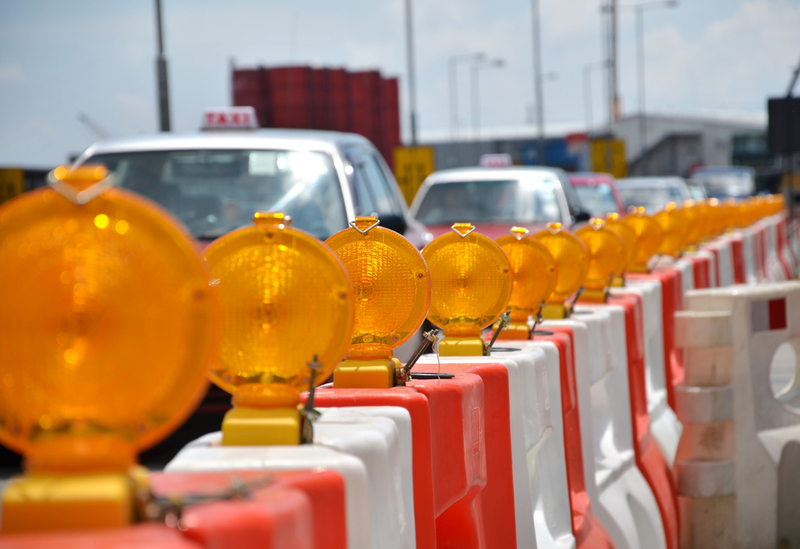 Construction vehicles cause traffic congestion, block roadways and may throw debris onto cars behind them, causing cracked windshields and even accidents. When road construction is being completed, it is critical that all drivers navigating the hazardous area are alert and obey all warning signs. Of course, the nature of these areas and changes to once-familiar roads creates the perfect circumstances for accidents. When roads are in disrepair, it is important to be aware of these hazards and how they can cause accidents. By simply paying attention to the surfaces driven upon and environments around roads, drivers can avoid many accidents. Some common indicators of road disrepair include potholes, faded striping, faded areas of pavement, cracks across the road, uneven surfaces, or loose gravel. Drivers should be particularly alert when their vehicle jostles about when changing lanes or driving on particular stretches of the road. Guard rails can become hazards when a vehicle has hit them and peeled them out of place, protruding into a lane or no longer providing protection at the side of the road. Damaged signs, covered signs or missing signage can be indicators of general disrepair of roads and the need to be particularly cautious for other road hazards. Government and private businesses often hold liability when road conditions cause auto accidents. This is because they are responsible for designing, building, maintaining and reconstructing safe roads. When accidents are caused due to poor road conditions, the government and business representatives may be held liable for compensation. Federal, state and local governments often specify obligations and responsibilities of those tasked with maintaining safe roadways. When you or someone you love have been injured in an accident or suffered property damage caused by issues with a road, bridge or other infrastructure, government or private businesses may be responsible. An experienced auto accident attorney can help determine where responsibility may exist and whether negligence was the cause of the auto accident. It is possible to gain compensation for injuries and damages resulting from car accidents caused by dangerous road conditions. Every day in the United States, an estimated 445 pedestrians seek emergency treatment for traffic-related injuries. 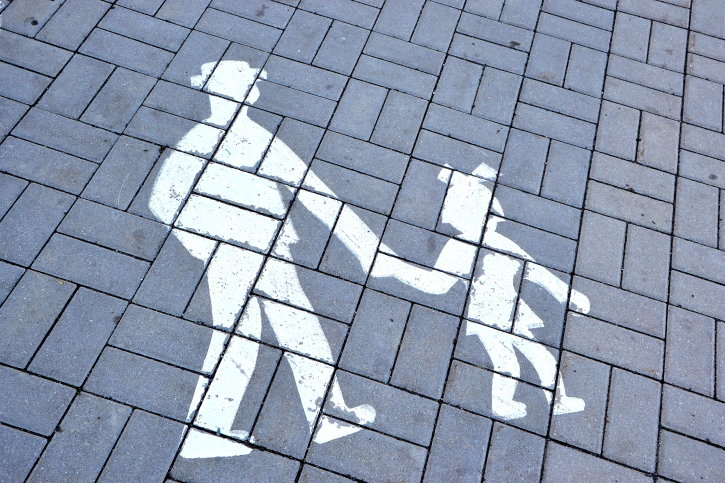 In 2013, the most recent year data is available, there were 4,735 pedestrian fatalities and another 66,000 injuries. That’s about one pedestrian death every two hours, and one injury every eight minutes. If you are one of the tens of thousands of pedestrians injured every year as a result of a vehicle-related accident, there are critical steps you should take directly after the event that will help ensure your rights. But, avoiding an accident in the first place should be your focus. Here are some easy-to-follow tips on how to stay safe as a pedestrian. Just because someone is driving a vehicle doesn’t mean he is paying close attention to the road. Distracted driving habits, including eating and cell phone use, lead to more than 3,300 fatalities a year, many of which involve pedestrians. Other factors, including vehicle blind spots and driver drowsiness, can also play a role in pedestrian-related accidents. Instead of assuming that a driver can see you, make sure the road is clear before attempting to cross the street. If you’re in a particularly busy area, and waiting for traffic to clear isn’t plausible, make eye contact with any driver in your proximity before crossing the street, even when you have the right of way and are using a crosswalk. Drivers are not the only people who can be distracted when they’re on the go. Pedestrians can be just as easily distracted. When you’re reading a text message, playing a game, or are otherwise engaged with your mobile device, you aren’t paying attention to your surroundings, and just as with a distracted driver, the results can be disastrous. When you are walking, put away your cell phone or tablet. If you must reply to a text, step to the side, out of the way of others, and then respond. Jaywalking is not only illegal, but it can be fatal. In fact, pedestrian noncompliance is the leading cause of injuries and fatalities. In 2013, 69% of all pedestrian fatalities occurred at non-intersections compared to 20% of fatalities occurring in an intersection, according to the National Highway Traffic Safety Administration (NHTSA). The balance of the fatalities occurred in parking lanes, driveways, roadsides, and other locations. When you need to cross the street, use the crosswalk, and never cross against the light. The sidewalk is the safest place for pedestrians. Occasionally, however, you may find yourself in a situation where you have to walk somewhere, but no sidewalk is available. In that instance, walk as far onto the shoulder of the road as possible, and always walk facing traffic. If your back is to traffic, you won’t be able to see oncoming dangers, and you’ll be unable to avoid them. If you’re walking at night, it is imperative that you wear light, bright, or reflective clothing, and carry a flashlight, even if you plan on staying on the sidewalk. At some point, you may have to cross the street, and if drivers cannot see you, they won’t be able to avoid you. Pedestrian safety requires vigilance on the part of both the driver and the pedestrian. When you head out for a walk, always follow traffic laws, make sure drivers can see you, and pay attention to your surroundings. When you follow those simple tips, you’ll be increasing the odds that you will reach your destination safely. 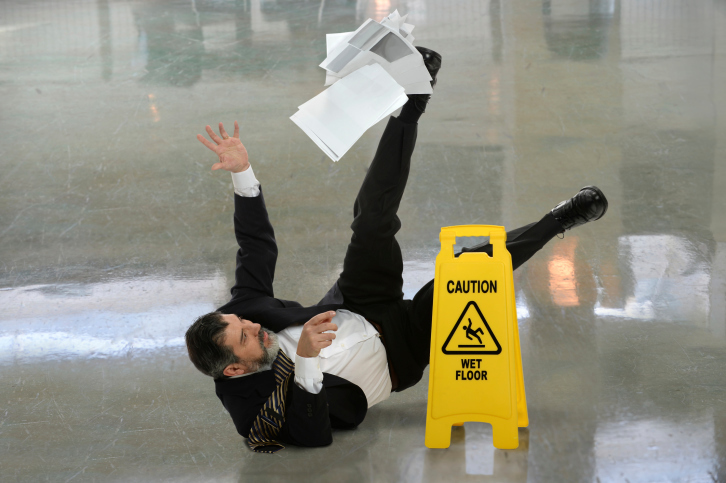 When it comes to slip-and-fall accidents, as a business owner, strong preventative measures are the key. You never want to see a customer have an accident due to carelessness and oversight on your part, so consider taking these steps beforehand to making your property the safest it can be for customers and employees alike. Basically, your property needs to be safe for a “reasonable person,” that is, someone who is taking normal care to avoid danger, and is avoiding obvious obstacles. You as a business owner need to rid the property of any hidden or obvious dangers that could result in a slip and fall. The best thing you can do it to train all employees, especially managers, to be vigilant and to deal with these issues immediately. We’ll walk you through some tips address common causes of slip-and-fall injuries, and what you can do to prevent them. First, consider seasonal hazards. One of the most common times for slip-and-fall injuries is, of course, the winter, when ice and snow make pathways hazardous. So, keep all sidewalks, driveways, ramps and staircases free of slippery ice and snow. In the fall, keep these areas free of fallen leaves, which can be surprisingly slippery as well. Remember that outside areas, if they are on your property, are just as much your responsibility to keep safe as the interior areas are. Make sure there is no uneven flooring. A normal person isn’t looking down everywhere he or she walks, so if there is an uneven walking surface, broken tiles or other problems, he or she could easily trip and fall. If anything gets spilled, put up a warning sign, and clean it up quickly. This is very common in restaurants, where even a flying toddler’s drink can create a slippery hazard. It may also come in car-repair businesses, where grease puddles can be especially treacherous. More generally, this can also be a seasonal issue, as wet boots and umbrellas can create hard-to-see puddles. Keep your property free of clutter. Without realizing, it, employees can often place materials in passageways or, even worse, in stairwells—so train them to keep these areas clear. Not only will this make the property more appealing and easy to navigate, but it will also prevent visitors from bumping into stray boxes or other items and hurting themselves, or falling down stairs. Also make sure that nothing is obstructing an exit pathway. Put up warning signs beside any elevated surfaces. It may be common sense to be careful on a platform or a ladder, but remember that, as the owner, you’re used to them, whereas new visitors are not; it’s better to be safe than sorry. Invest in good lighting. It may sound silly, but a dark environment is much more prone to accidents, especially for older people. Besides, better lighting will improve visitors’ overall experience at your business, so it’s well worth your while. Once again, this includes exterior as well as interior lighting.